a. Derived products which have established themselves in their own right. Fruit juices, citrus in particular, tomato paste and wine are clear examples, even to the extent that fruit selection and breeding is directed towards optimal use for this purpose. b. Temporary surplus of fruits because of abundant harvest and/or insufficient marketing outlets of a perishable commodity. On occasion this happens and one resorts to the use as animal feed or alcohol making, when feasible. c. Damaged, undersized fruit of unattractive appearance, and presence of foreign matter. As far as dates are concerned the raw material for derived products is mainly found in the last area (c), or, in certain circumstances, in combination with a surplus situation (b) of usually the more common date varieties. But no instance is known where sound, whole dates are utilized for the purpose of making derived products, for the simple reason of not having an economic justification. The production of derived date products is therefore dependent on the existence of quantities of second grade fruit, resulting from inadequate or marginal production systems, or as graded out fruit from large scale date packing operations. For a general view of the scope and opportunities to produce derived date products it is useful to look at a homogenized date flesh/water mixture which has been centrifuged in a tube centrifuge (Fig. 76). The following observations can be made. At the very bottom of the tube sand and dust are collected 1.; the layer above that shows pieces of date skins, fibrous particles, and insect fragments 2. More upwards the material becomes lighter in colour and turns into a greyish slurry 3., gradually turning into a clear liquid 4. The extent of layer 3. and its demarcation line with the clear layer 4. is related to the date variety and stage of maturity. Sometimes it is difficult to obtain a clear layer 4., indicating that we also deal with semi-solids and colloids. Layer 4. contains the sugars and other soluble solids of the dates, which extends also through the layers 3., 2. and 1. At the very top of the liquid a thin film of material (fat, perhaps) can sometimes be found. It is clear that the above identified qualitative distribution of materials in the tube is also a function of Brix level of the date flesh/water mixture. If a heavier slurry is employed the demarcations are less pronounced because of less difference in specific gravity on which the centrifuge action is based. Table 13 gives an overview of the major possibilities for derived date products. For all these products dates are mixed with water in order to facilitate the separation of the desirable and undesirable components of the date. For some products the added water will be incorporated in the final product such as for soft drinks and date wine; in others, water is added in such an amount as to create the right medium for the subsequent production process. This is the case with all products based on microbial conversion. In both cases therefore the amount of water to be added is governed by the subsequent process and products. However, when the envisaged final product is concentrated, notably date spread, date syrup and date liquid sugar, water acts only as a temporary carrier to facilitate the subsequent separation process, after which the water is removed again (by evaporation). As this last operation is relatively expensive (investment and energy), one therefore tries to obtain the desired effect with the minimum amount of water added. This has brought about a number of extraction processes, in which the retention time, cost of investment, residual losses, sugar concentration are balanced to arrive at a minimal overall unit cost for the extracted date juice. Though date juice (in its different compositions) is not a product in its own right, but its extraction from dates forms such an essential operation in further product processing, the subject will be elaborated in the first paragraph of the discussion of the various derived products from the date. Dates are different from other fruits from which juices are obtained by pressing (e.g. citrus, berries, grapes) in that their soluble solids are too concentrated to be pressed out. A minor exception was described earlier where syrup (dibs) is produced as an incidental by-product when bagged humid dates are heaped and over a period of months some syrup oozes out by the force of their own weight (Fig. 42). To make date juice, water has therefore to be added to dissolve and dilute the soluble solids of the date, after which the non-soluble solids are separated out. To create the best conditions for an optimum extraction (least cost commensurate with best quality and highest yield) at an industrial level several factors have to be taken into account. A whole date put in cold water will take a long time to be extracted, the latter which, technologically speaking, means that the soluble solids in the surrounding liquid reaches equilibrium with the liquid in the date itself. Stirring and raising the temperature will shorten this time, but not that much. "Time is money" is an appropriate saying in this respect because the more time is involved the higher capacity of containers and other machinery is needed to produce the same amount of juice/day. The next step to reduce time is to increase the contact area between water and date flesh to facilitate a quicker exchange of soluble solids. This can be done by pre-treatment such as crushing the dates or cutting them into pieces. The extreme situation of increasing surface contact is to thoroughly mix dates and water, like in a household mixer, when equilibrium is reached almost instantaneously. However, this method puts a much heavier burden on subsequently removing the non-soluble solids, because these become finely divided, and colloidal and pectinous material may be released which hampers separation from the juice. Nevertheless, at least one proposed date juice process is based on this principle (108). Before discussing the percentage of soluble solids (the Brix level) at which the date juice will be produced, and which obviously is a function of the date composition and the amount of water added, first an easy tool (the material balance) to visualize and calculate an extraction system, is given. In its simplest form a calculation will be made if date (flesh) is extracted with water in one step. For this purpose the composition of the date as far as moisture, soluble solids and non-soluble solids, should be known. Also, the moisture content of the remaining cake after separation of the juice. This percentage is related to the type of separation used and has to be found experimentally in the laboratory. Obviously, moisture content will differ according to whether separation is achieved by simple draining, sieving, pressing or centrifuging. Furthermore, it is assumed that during contact equilibrium in the slurry is reached, non-solubles remain in the presscake and no evaporation of water takes place. All three conditions in practice cannot be entirely met, thus somewhat reducing the effectiveness of the calculated system. - Equilibrium has been reached in the slurry, hence the Bx level (SS) of the liquid is 70/90 = 35.8° which is also the Bx level of the separated juice and the liquid remaining in the presscake after separation. Out of these x and w can be solved and the composition of the presscake determined (x = 21.4; w = 38.4) as well as all other underlined figures. Conclusions: The calculation shows that when dates are extracted in one stage with an equal amount of water, the Bx level of the juices reaches about 35° , but the Bx loss in the press cake of 55% moisture is (intolerably) high (30%). This loss would be even higher when the date juice would be recovered by draining only (say 60% moisture in the residue). To reduce the loss of soluble solids one should therefore, in the first instance, have a most efficient separation of NSS and SS in the solution. For instance, if a presscake could be obtained of 50% moisture, the calculated loss of SS in the presscake would already have been reduced by little over half (12.6 kgs out of 70 kg). At 40% moisture this loss would be halved again (5.9 kgs out of 70 kg). However, experience has shown that for the type of material at this Bx level the available process equipment does not go below a cake containing 55% moisture. caused by the fact that the Bx level of the juice retained in the cake is lower. The calculated figures (underlined) are found as for Table 14. Conclusions: The amount of SS loss in the presscake (9.3 kg out of 70) is reduced from 30 to 13.3%, which however is still considered too high for an extraction process. Moreover this reduction has been achieved at the cost of increased equipment volume (about twice as high) and a higher amount of water that has to be evaporated (from about l l/kg of syrup (75° Bx) for the first case to a little over 2.5 l/kg of syrup for the second extraction system. From the above examples it can be deduced that one-stage extraction, unless the loss of soluble solids in the presscake is of no predominant economic importance (normally one would aim at a loss not exceeding 5% of the original soluble solids input), is not an optimum solution. Also the proposed one-stage extraction by complete disintegration of the date (108) in spite of the time reduction to reach equilibrium in the date/water mixture, pays the price of having to employ an elaborate and expensive separation system (vacuum band filter) and having to reduce the Bx level of the juice to below 15° further aggravated by washing the filtercake with fresh water to recover some of the residual soluble solids from the filtercake. It is to be noted that at a level of 15° Bx it requires 4 l of water to be evaporated for each kg of syrup (75° Bx), compared to about 1 l at 36° Bx juice and 2.5 l at 21° Bx. Washing out the cake in order to recover some of the residual soluble solids leads us to a two (or more) stage extraction system. The main characteristic of this system is that the added water is used twice in a countercurrent system. This results in much less loss of residual soluble solids compared to a one-stage system, but maintains the same Bx level in the extracted juice. However, as a consequence the extraction and separation equipment has to be doubled in number. Figure 77 shows the diagram for both a one-stage and a two-stage extraction system. The calculations for two-stage extraction are more complex than for a one-stage system, but is based on the same type of data, i.e. composition of the dates and the moisture content of the presscake(s) and the assumption that equilibrium between dates and the extraction liquid is reached, no non-solubles pass into the extracted juice and no water is lost in the operation. To obtain a deeper insight into the possibilities and limitations of date juice recovery, in Appendix III a two-stage extraction system is calculated for a date juice of 30° Bx and compared with the measured results of a two-stage extraction system in an experimental date syrup plant in Libya. a. There is an excellent correlation between the calculated and measured results with regard to soluble solids recovered and lost in the presscake (respectively 94.9% and 5.1%) which also is a satisfactory result from a techno-economic point of view. It would probably not "pay" to add a third extraction stage only to recover part of the 5% now lost. In case more yield is required or desired one could in this case lower the Bx level of the extracted date juice somewhat. b. The main difference between the two material balances is that in the actual operation a good part of non-soluble solids ends up in the recovered date juice. This is caused by the separation equipment used and will influence the subsequent clarification of the juice, but it does not seem to influence the efficiency of the extraction system as a whole. c. The calculated extraction schedule was based a.o. 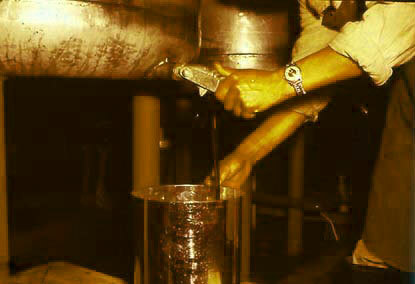 on reaching equilibrium between the dates and the extraction liquid. In the pilot plant results we find that in the first extraction step a high degree of equilibrium is reached (30.8° in S1, and 31.0° in P1) but less in the second (9.4° in S2 and 14.9° Bx in P2). Although already referred to in the general considerations affecting the performance and efficiency of an extraction system, mention should again be made of the temperature of extraction and the contact intensity between material and liquid. Increase of both will shorten the time for equilibrium to be reached which is of great importance to the volume of the equipment required. The retention time, i.e. the time the material remains in the system may, according to the equipment used, vary from a couple of minutes (one stage, complete maceration of the date) to up to 6 hours in a stationary batch system. With respect to temperature, the upper limit is considered 65° -70° C if no changes in the chemical composition of the juice are wanted. Contact intensity is improved by increasing surface contact and by stirring. Surface area can be increased by crushing or cutting the date and for stirring extra equipment will have to be incorporated, which normally also serves to move the product through the system in a continuous operation. The various process variables and equipment options, also in part determined by the type of date juice required, have brought about a number of extraction systems ranging from batch to co-current and counter-current versions in one or more stages with separation based on centrifuging, pressing, screening or simply draining. Each of these systems has its own characteristics and performance data, but they are all based on the same basic principles of extraction as explained before in this chapter. Specific applications are reported in literature (528) and will be identified under the various products derived from date juice. Where relevant some of these technologies will be discussed further with the products for which they are used. Traditionally, a date drink (nabidh) was prepared by soaking mashed up dates in water for one night (but not longer) (445). Clarified date juice, i.e. the natural juice containing only soluble materials of the date, has found little direct use because of its rather flat taste unlike other clear fruit juices such as from grape, apple and berries. For its production usually filtration of the raw juice (with the help of filteraid) sometimes preceded by a quick boil to precipitate some of the colloidal matter in the raw juice, is sufficient. Centrifuging may also give the desired result but this is also linked to the initial turbidity of the raw juice. Calcium hydroxide, gelatin and tannin have been used to remove this turbidity (426). Several attempts have been made to prepare beverages, carbonated or not, based on date juice, but most of the time the juice needs reinforcement with organic acids and additional flavours to arrive at acceptable products (511). A home-made date juice drink is proposed by boiling dates and water in equal amounts, extracting the juice by squeezing through cloth. Juice is diluted, sugar and citric acid added (0.3%) and pasteurized in bottles (25 minutes in boiling water) (433, 177). Combination of date juice and milk is possible provided precautions are taken against curdling and whey separation by PH adjustment to 5.4-6.2 or 4.2-4.8 with addition of a stabilizer (596). Date juice has also been experimented with to replace sugar in ice cream making (532). Furthermore, date juice has been used in date jelly making in a small commercial fruit processing plant as part of the jam and jelly production assortment. The process consisted of mixing and boiling 60 kgs of date juice (42° Bx) and 48 kgs of sugar with 350 gms of pectin and PH adjusted to 3.4 with citric acid, to a level of 68° Bx. The product was hot filled in 1 lb jars and pasteurized for 10 min at 90° C.
Date juice concentrates, as the name implies, have in common that they are condensed products made out of date extract by water evaporation. They differ in appearance, taste and consistency depending on the type of the raw juice and the degree of concentration. Three main products can be distinguished: date spread, date syrup and date liquid sugar which, in this order, represent products with a decreasing non-soluble and soluble non-sugar content. Date spread, though it has reached a far advanced stage of product development, is not a commercial product. It is reviewed first in the range of juice concentrates because as a product it fits between date paste made of the whole date flesh, and date syrup, from which all non-solubles have been removed. 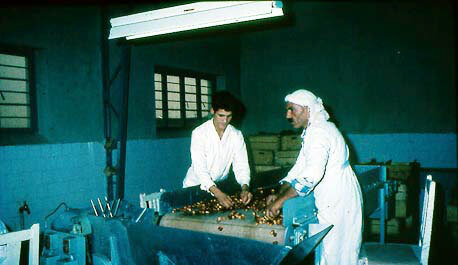 The idea of date spread originated in Libya in the sixties, when after having initiated date syrup production on a pilot scale and planning for a commercial factory, it was felt that increasing the product range would benefit the economics of the commercial date syrup factory as well as give some more scope to creating outlets for a second quality fibrous raw material, almost always contaminated with dust and other foreign matter including insect fragments. part NSS Centrifugation In 1 or 2 stages. iii. to reduce the Bx loss in the process, the required extraction water is first used to recover most of the soluble solids from the underflow (apex) of the hydrocyclones. A combined syrup/spread factory of 1500 ton/year capacity based on this principle was installed, but the practical results of spread production in this factory, are not available. By recording the research work on date spread in this Chapter one would like to see a renewed interest in its development because it creates an additional, different product made from inferior dates with applications similar to that of date paste (see Chapter 2). Date syrup (dibs, rub) is probably the most common derived date product, produced in three different ways: (i) as an accidental by-product in the storage of bagged, humid dates (especially in the Gulf area), (ii) at the home or village level by extraction and boiling down of the juice, and (iii) on a semi- and full industrial scale. The first "method" has already been mentioned before and reference to it goes back to the 17th Century (137). It yields not more than maximum 6% of the weight of the date, the quality of the syrup per se is quite good, because it is the direct natural fruit extract, but contamination with foreign matter, because of the rudimentary ways the product is collected, is quite high. With regard to home or village level production, which mainly occurs on special occasions, such as the birthday of the Prophet or the birth of a child, the following data from a field experiment are a demonstration of such a rural process (63) (Fig. 80). Dates (25 kgs) are mixed with water (ratio 1:1) and left to boil on a wood fire for about 1½ hours. The boiled pulp is coarsely filtered in a basket of woven halfa grass or palm leaflets; the juice is collected and water is again added to the presscake and the mixture is boiled again. 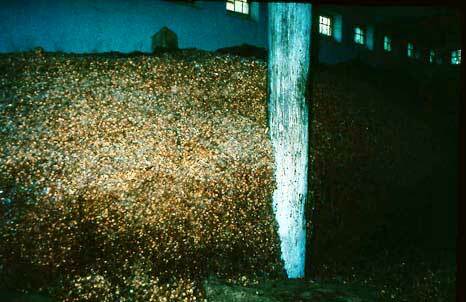 This extraction is repeated 4 times in total after which the presscake is discarded or fed to the animals. The combined collected juice (in this case, 40 kgs of 28° Bx) is now filtered through a cloth and boiled down. During boiling a piece of fruitstalk of the date palm is put in the pan "to avoid burning" according to the makers of the syrup. The only technological explanation for this measure is that it avoids boiling retardation and thus overheating, like the use of pumice stones in the chemical laboratory. Boiling down time depends on the intensity and efficiency of the fire but a few hours are involved. The end point of boiling is determined by dropping a few drops of the liquid on white sand: if the droplets enter the sand readily, the end point is not yet reached. If, on the other hand, they remain as little balls on the sand, the syrup is considered ready. In the experiment under review total syrup produced was 12.5 kgs of 67° Bx out of 25 kgs dates of 72° soluble solids, hence a rather poor outturn with much loss of sugar in presscake and handling. The same can be said for the use of energy because a total of 140 kgs of firewood was used (on Kcal basis more than 10 x the energy used for a similar quantity of syrup in an industrial plant). The process is also labour intensive: it took about 11 hours (for 1½ persons) divided over two days to finish this batch of syrup. In spite of this, a product that will preserve for years is made and if wood energy (palm wood) is plentiful and the cost of labour is not paid for, the cash cost of production is low. 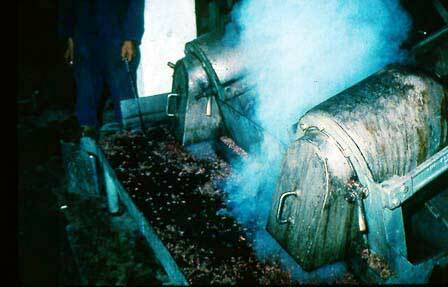 During extraction and boiling the juice develops a deep red colour which is carried on in the final product. The taste of the syrup is distinct, rather strong and resembles also in appearance somewhat prune concentrate. The local population, either because of tradition or indeed for its taste, in general prefers a dark coloured product with a strong flavour over the lighter decolourized versions of syrup. A slightly modified version of making home-made syrup is by soaking dates in water for 2 days and then boiling them thoroughly. The mixture is then pressed in a basket, the juice recovered and left in a pot in the sun for a week until thick (445). It makes one think of how honey bees collect nectar from flowers and concentrate it into honey by a system of drying induced by forced air movement in the hives. Another modified version (Southern Iraq) consists of boiling dates with water and pressing the date juice through filter bags by putting weights on them. The collected juice is concentrated in open pans by the heat of the sun, a process taking several days (321). Pretreatment may consist of slightly squashing the date between rollers to break the skin and facilitate penetration of the extraction liquid. The principles of extraction have been explained in the introduction to this Chapter. The trend over the years in extraction systems for syrup production has gone from the batch type to the counter current systems with more efficient separation techniques and shorter retention times, however with more complicated machinery involved. Clarification not only covers the process of freeing the extracted raw juice from non-solubles but is also concerned with, if so desired or required, removal of some solubles (e.g. colouring matter) and semi-solubles (e.g. pectins). Active carbon, resins, enzymes and filter aids have been used to reach this effect (71, 288, 78, 299). It is to be noted that, according to the clarification method applied, also some desirable substances like flavour components may be removed and the final product may, apart from having a different appearance and colour, also have a modified taste. Clarification, especially where it concerns the removal of solubles is therefore a delicate process, which has to be carefully explored and tested. The clarified juice, which normally will have a Brix level of 20-25° will now be concentrated, preferably under vacuum, to avoid as little as possible heat-induced changes in the materials and to be able to use energy saving multi-stage evaporation. The degree of concentration is a compromise between the rheological properties of the desired product (i.e. the syrupiness, its viscosity and thickness) and the microbial and physical stability. Date syrup from most dates consists for the greater part of a mixture of fructose and glucose and a minor fraction of sucrose and other soluble matter. The saturation points of the individual sugars in pure solutions are known, but in a mixture these figures do not apply. However the general rule exists that though in a combined solution different solutes will depress each other's saturation point, the total solubles content in a mixed saturated solution will be higher than for each of the single components. For instance, at 30° C one gram of water will dissolve 2.19 g of sucrose, but 7.3 g of solute made up of sucrose and fructose. If glucose is added to provide a solution saturated with respect to all three solutes, a total solute concentration of 8.8 g/g of water can be reached (216). This principle has been used to retard crystallization in date syrup (derived from invert sugar dates) by adding 10% of sucrose to the syrup, thus reaching a higher saturation point. With regard to physical stability experience has shown that below 70° Bx the possibility of crystallization is remote (saturation of pure sucrose is 67.9° Bx at 25° C, for glucose about 50° Bx, for fructose 80.2° and for invert sugar 66.2° ). However at that density the syrup is rather "thin" and microbial stability (without specific preservative precautions taken) is marginal, at best. For some syrups derived from certain varieties gellying may occur upon storage. This effect is generally attributed to high pectin content of the raw material and is counteracted by pretreatment of the extracted juice with pectinase, a pectin decomposing enzyme. Producing stable date syrup in all aspects is therefore a compromise and helped by auxiliary methods like adding a "foreign" solute like sucrose, sharp filtration (to reduce crystallization nuclei), and pasteurization (to prevent or retard microbial spoilage). A most common density for date syrup is 75° Bx at which level it is self-preserving and crystallization only occurs after prolonged storage. These figures show that although during the intial breakdown of sucrose both reducing sugars are formed in equal amounts, during storage and processing of the dates the less stable fructose is more liable to be decomposed and hence the glucose becomes dominant. This also has an effect on the purity of the solution, notably in syrups produced at high temperatures and long processing time. Different aspects of industrial date syrup production are demonstrated in Figure 81. The traditional use of date syrup is mainly on specific occasions, e.g. poured on cooked and sometimes fermented dough (asseeda) on the occasion of the Prophet's birthday. Consumption is also more intense during the cold periods of the year. Date syrup is widely used for softening and preserving dates in jars and in home-made confectionery. Use on bread has become increasingly accepted. Early records reveal (445) that date syrup in the past may have been an overland export article between the Gulf area and China, a product even more concentrated than the date itself and easily turned into a nutritious drink. The more recent efforts to broaden the field of application for date syrup as a product in its own right have focused on the use as a base for beverages, in confectionery, bakery products and ice cream. Although there have been several attempts to produce a date soft drink, the results have not been encouraging, probably in the face of the strong competition for this type of product. In the preparation of soft drinks from date (syrup) an extra clarification of the diluted juice (615) and a reinforcement of the flavour and acidity are almost a must if a typical soft drink is desired. But apparently it is possible if the right formula is found because a carbonated date syrup based soft drink (of Swiss origin) is marketed in Saudi Arabia under the name of "Tamra". In the U.S. several attempts have been made to introduce date syrup along similar lines as other fruit juice concentrates as from raisins, figs and prunes for use in the preparation of cakes, cookies, sweet breads, etc. It was also sold in squeeze tubes for direct use on pancakes. Furthermore several tests have been made to use date syrup as a sweetening (and flavouring) agent for dairy products. Date flavoured buffalo skim milk (483), and fermented milk products, like yoghurt, flavoured with date syrup (516) were researched with good results. 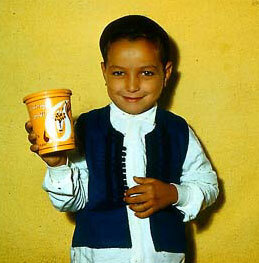 Likewise a date juice milk beverage could be successfully produced from date syrup and powdered or fresh milk. With proper PH adjustment (over 6) to prevent curdling and UHT treatment, drinks were produced that had a shelf life of 3 months at room temperature. The ratio of the to 20°Bx diluted date syrup and milk was 4:6 (606). Date syrup can successfully be used as a sugar replacement of up to 15% in ice cream making without affecting overrun or viscosity (199). The use of syrup in ripple ice cream has also been reported (302) but early crystallization at the low temperature may be a handicap, though it was found experimentally that date spread did not have this problem. Partial replacement of sugar (6% on flour basis in the control) by date syrup in sweet bread making proved feasible up to a point when crumb structure and dough colour deteriorated and became a limiting factor (618, 484). In cakes these factors were much less pronounced and up to 17% sugar replacement could be achieved without significant quality changes in the cake. It was also found that date syrup could replace honey by up to 75% (368). In tests carried out with wheat, sorghum and millet biscuits crystalline sugar of the control formulae was replaced by date syrup ranging from 0 to 60% (at 10% intervals) for wheat and sorghum and 0-20% (at 5% intervals) for millet. All invert sugar used in the recipes was also replaced by date syrup. The conclusions of these tests showed that for wheat and sorghum biscuits up to 50% of the sugar can be replaced without affecting quality. For millet biscuits the tolerance to replacement is much less and not more than 10-15%. At higher level the millet dough becomes sticky and difficult to handle (280). Use of date syrup in animal feed as a substitute for molasses was tried (448) and showed an increased digestibility of hay in a diet for lambs. Feeding trials on alternating lucerne supplemented with, respectively, date molasses and urea, or pelleted concentrates, or only date molasses were not conclusive (448). A more curious aspect of the use of date syrup are the reported excellent results from feeding it to racing camels. Caramel usually used as a colour additive in food processing is an amorphous, dark brown material resulting from the carefully controlled heat treatment of food grade carbohydrates like dextrose, invert sugar, molasses etc. 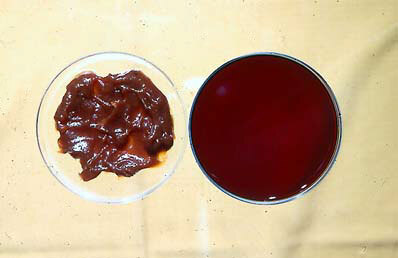 Thin date juice and diluted date syrup were experimentally tested as the raw material for the production of caramel and their characteristics compared with commercial caramel. Though potentially, especially date syrup, a promising raw material, the process still needs perfection to reach the specific characteristics for certain applications, notably the acid resistance as required in soft drinks (334). Concluding this chapter on date syrup it may be stated that this product is the most promising where it concerns the use of off-grade and contaminated dates. It can be and is produced in the home, in the village and on industrial scale, it has reached export status with deliveries to non-date producing countries and can be bought in the market in practically all date producing countries for direct use. With regard to industrial use, the development work should continue. There are several worthwhile technological opportunities though in economic infrastructures with more convenient and cheap foreign products becoming available it is not always easy to introduce a fledgling national product. If in all previous date products described the date flavour, either natural or in a modified form, was an integral part of the product, liquid sugar is an attempt to make use of the date as a sugar bearing fruit to be exploited for that purpose like sugar beets or cane. Having the same purpose in this case a comparison must therefore be made with regard to the utility and economics of these other sugar sources. As yield per ha the date does not fare too badly if one considers that a well kept plantation with 125 palms per ha at 100 kgs dates per palm (60% sugar) would produce 7.5 tons sugar per ha. Sugar yield from beet is in the same order of magnitude whilst cane sugar is more and can go as high as 25 t/ha. The com-petitive position of dates as a sugar source is however weakened by the relatively greater difficulties of introducing large-scale mechanized farming as is practised for beet and cane sugar. Secondly, its utility is highly restricted by the fact that no date contains sucrose alone but on the contrary, this sugar constitutes in most cases only a minor part of the total, the rest being invert sugar composed of more or less equal parts of glucose and fructose. And these sugars are difficult to turn into crystalline products and do not have the same convenience of use as has sucrose at the household level. Use of date sugar must therefore be sought in the form of liquid sugar in industrial applications in competition with liquid sugars derived from sucrose or corn syrup and high fructose corn syrup (HFCS). These syrups have a distinct market nowaways but mainly on an industrial level. A third restriction in the use of date sugar is economy of scale. The type of industrial process involved, with a high cost of investment and multiple process steps, makes it very sensitive to the scale at which production takes place, with production costs proportionally rapidly going down with increasing capacity. 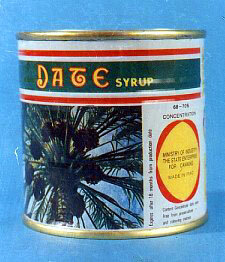 Against the above background it would therefore seem that the only chance of profitably exploiting the date as a sugar source would be in the case of an abundant supply of dates, too big for direct local consumption, and the existence of an outlet for industrial liquid sugar, with little or no competition from similar local raw material sources. The great majority of the date producing countries do not, for one or other of the above conditions, qualify, except for Iraq and it is in this country where a liquid date sugar industry has developed over the last thirty years. Liquid sugar may have its disadvantages in handling and dosing, especially on small-scale, it also has some advantageous characteristics for certain applications vis-a-vis sucrose, such as less tendency towards crystallization in the products it is used and a moisture retaining capacity thanks to its hygroscopicity. But so has liquid invert sugar derived from sucrose. It remains therefore to a great extent the economics (mainly determined by production - and raw material costs) whether there is a niche for date liquid sugar in the market. Whilst in sucrose production the major part of non-sugar solubles remains in the mother liquor and the sucrose is crystallized out; whilst in corn syrup production the raw material (maize starch) is relatively pure, in date liquid sugar production all undesirable non-sugar components from the date juice have to be removed. Consequently clarification costs for refining date syrup are higher than for syrups derived from cane or beet (227) and it will involve several rather delicate and expensive operations. It is therefore an extension of date syrup production which involves chemical clarification by precipitation, decolourization by adsorption and demineralization by ion exchange (435). Liquid invert sugars come in different versions with regard to the distribution of the three main sugars involved (sucrose, glucose, fructose) but the quality requirements with regard to other components are very rigid, especially in the beverage industry. A few ppm of iron can cause a change of flavour, colour and PH of chocolate syrup, and ash content of less than 0.1% is quite often not enough and easily affects delicate flavours of raspberry and cherry (435). The syrup should be odourless, and crystal clear. Furthermore crystallization should at all times be avoided because it will create great problems in handling, transport and use in the factories. This requires a careful control of the sugar combinations in the syrup, because the high purity of the liquid sugar (unlike in date syrup where soluble non-sugars also assist in raising the solubility of the total solids) the saturation point is governed by the partially depressed saturation points of the components. Solubility of pure invert sugar is 69.7 g/100 g (69.7° Bx). At 50% sucrose and 50% invert the saturation point for the total solids reaches 77° Bx. In other words, the more the reliance on the two hexoses, as in most dates, the lower the saturation point will be and the more danger for microbial infection will exist. The above considerations of liquid sugar from dates serve to illustrate that the production and use of date liquid sugar has many particular aspects and it took well over twenty years of technical research and feasibility studies before a plant was established in Iraq by the end of the seventies. Use of date liquid sugar is focussed mainly on those products where application of date syrup for its flavour or colour is less desirable. Soft drinks (423), light coloured cakes (18), jellies and fruit preserves, confectionery and ice cream are main target products. Research on separating glucose and fructose has focussed on selective adsorption on specific resins. Conversion of glucose into fructose apart from isomerization by enzymes has also been tested with sodium aluminate technique (490, 354). The motivation for this research is that glucose and fructose have distinct properties of their own, which can be best exploited on the single sugar because in a mixture these specific qualities are mutually weakened. For instance pure glucose with low solubility (54.6 g/100 g) can be crystallized into a dry stable powder, but has the lowest sweetening power per gram. Fructose, on the other hand is highly soluble, hygroscopic, heat sensitive and less stable, but has the highest sweetening power per gram (which pleases the weight watchers). These rather contrasting properties therefore justify a use of these sugars in their own right. An example of partially reaching this goal is high fructose corn syrup, in which, by an enzymatic pretreatment, part of the glucose is converted into fructose, thus diminishing the crystallization aspect of glucose, obtaining more sweetness per gram of product and reaching a higher saturation point. Along the same lines, there have been several research efforts to produce solid sugars from the date, though prospects of obtaining a comparable product like table sugar (sucrose) seem doomed from the onset for two main reasons: i. sucrose at best, but in a very few varieties, reaches half of the total sugars and, ii. one of the sucrose derivatives, fructose, is very hygroscopic. Nevertheless some researchers have worked on the subject. In one case (145) a proposal is made to settle for a more or less white sugar paste (like cystallized honey) packed in impermeable film, accepting the increased difficulties of dosage in small portions at the consumer level. A patented process for crystalline invert sugar derived from a highly concentrated date liquid sugar is also on record (148, 403). A third approach concerns experiments with the selective solubility and crystallization of sucrose in ethanol (ethyl alcohol). By a process of acqueous ethanol extraction, filtration, evaporation and crystallization, sucrose crystals could be recovered in the order of 10% of the weight of the dates (583, 240). Another type of sucrose recovery by removing glucose and fructose from the solution by selective bacterial digestion is also reported (404). Modern sugar technology is undoubtedly capable of separating sugars out of mixed solutions and produce dry, flowing, crystalline or amorphous sugars. Also fructose, the more difficult one to handle but often quoted as a preferable sugar in pharmaceutical use or combined with artificial sweeteners, has been mastered by these technologies. However, two major obstacles arise as to the use of dates for this purpose: internationally, the severe competition of other basic sugar sources like cane, beet and starch crops; nationally, in the date producing countries, (if not for the same problem of alternative raw materials), today's lack of sufficient demand or size of the market for these types of products.